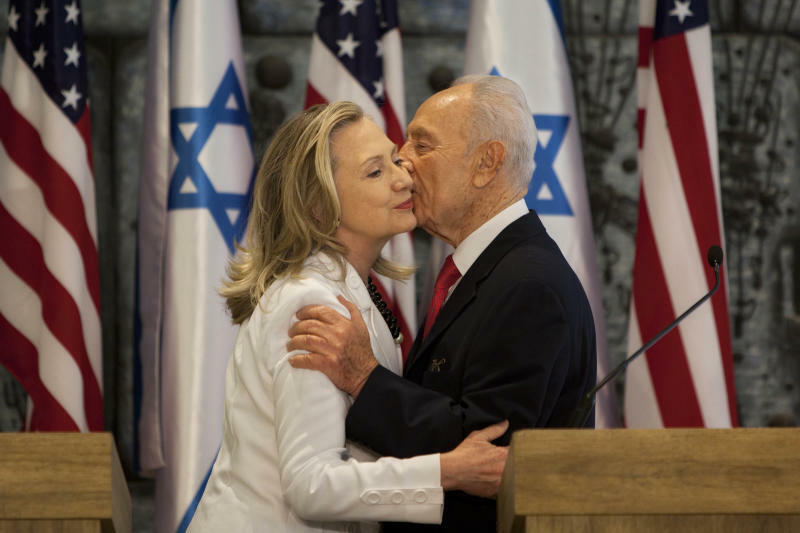 JERUSALEM (AP) — Mideast peace, America's defining issue for decades of dealings with Israel and its Arab neighbors, was just a postscript Monday as Hillary Rodham Clinton made perhaps her final visit to the region as secretary of state. Three years after President Barack Obama declared the plight of the Palestinians "intolerable," his administration no longer sees the failing Arab-Israeli peace efforts with the same immediacy. U.S. interests are focused now on Iran and Syria, though the deep differences between Israel and the Palestinians are not ignored. 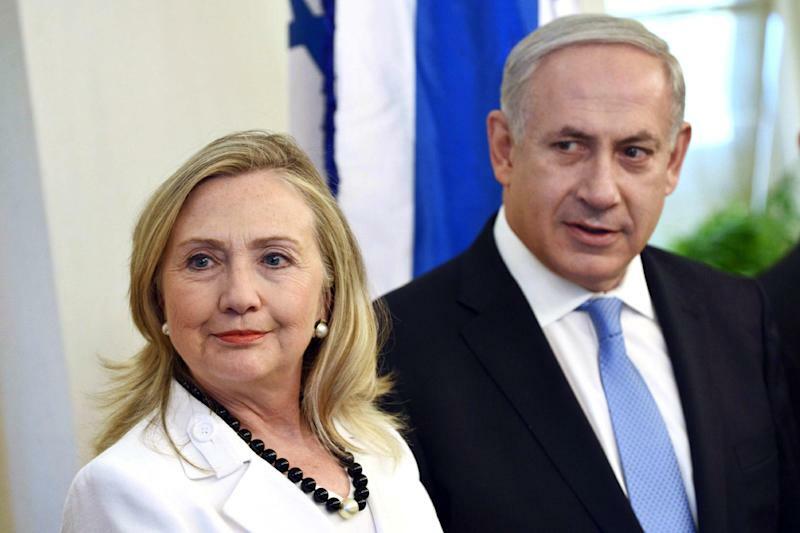 "Peace among Israel, the Palestinian people and all of Israel's Arab neighbors is crucial for Israel's long-term progress and prosperity," Clinton said following discussions with Israeli Prime Minister Benjamin Netanyahu and the country's president, foreign minister and defense minister. Clinton also met Palestinian Prime Minister Salam Fayyad, but she couldn't report any progress toward an accord that might secure an independent Palestine and an Israel at peace with its neighbors. In a departure from the usual pattern for top U.S. diplomats, she did not travel to the Palestinian Authority's West Bank seat of government in Ramallah. Israel has defied Obama's call to halt settlement construction in occupied lands, and the Palestinian leadership in the West Bank has refused to resume negotiations, leaving peace hopes in a tense status quo with no breakthrough in sight. Both Israelis and Palestinians are frustrated with one another and with Obama's peace efforts so far. Palestinian spokeswoman Hanan Ashrawi said Obama's Mideast policy has been a "disaster." "The American standing and credibility have never been worse than now," she said. "A major power is being constantly humiliated by Israel, and they put up with it and they take it." Obama acknowledged frustrations in an interview Sunday, but in many ways the region's crises and Washington's priorities have moved on. Syria's civil war, Egypt's political instability and the Iranian nuclear program have all overshadowed the moribund peace process. "I have not been able to move the peace process forward in the Middle East the way I wanted," he said. "It's something we focused on very early. But the truth of the matter is that the parties, they've got to want it as well." Iran's nuclear program has become the most pressing problem for the U.S. and Israel, and one that is a far easier cause to take up for an American administration in an election year. Republicans have consistently criticized Obama for putting too much pressure on Israel in the peace process and being too weak on Iran. Israel is getting more attention at the moment as the U.S. political race proceeds. Clinton's trip followed a weekend visit by Obama's national security adviser Tom Donilon. Defense Secretary Leon Panetta is expected to visit Israel soon. In a further sign of Israel's prominence in domestic U.S. politics, Republican presidential candidate Mott Romney is to visit a few days after Clinton. Her visit was seen by many here as a politically motivated attempt to pre-empt the Romney visit. Years ago, some of the biggest diplomatic gatherings around the world focused on Arab-Israeli peace efforts. These days they concern Iran and its disputed nuclear program. The U.S., Britain, China, France, Germany and Russia have held three rounds of inconclusive high-level talks with Iran since April. Israeli officials believe that Iran could have the ingredients and know-how to build a nuclear bomb in a matter of months, though they say it would be at least another year to the actual manufacture of the weapon. That has raised fears around the world that Israel could strike in the near future. Israel considers a nuclear-armed Iran to be a mortal threat. Another major Israeli — and American — concern taking attention away from the Palestinians is the situation in Egypt. For three decades, Israel's security was in part defined through its peace treaty with Hosni Mubarak's Egypt. Mubarak's ouster last year opened the door to the hardline Muslim Brotherhood, which for years vacillated on the question of acceptance of the Camp David Accords and Egypt's military cooperation with Israel. 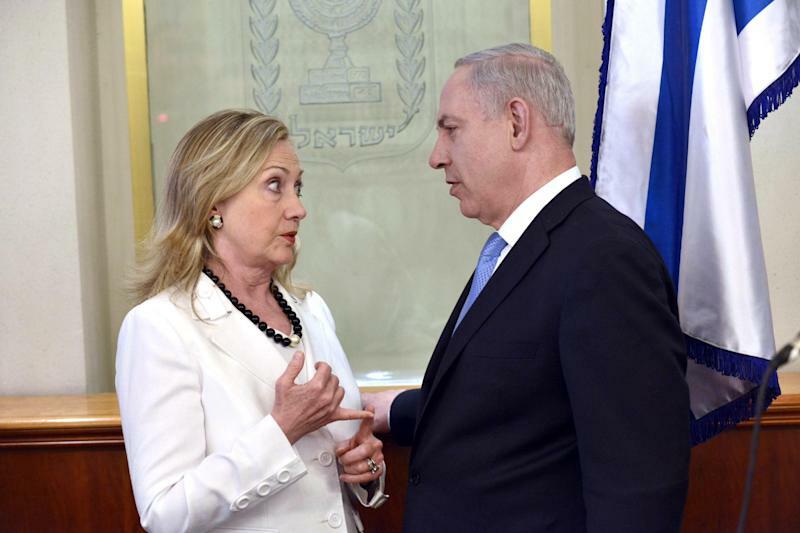 "There is no going back," on the treaty, Clinton said in Israel. She had been in Egypt a day earlier. The success of the Brotherhood has played into Netanyahu's narrative of distrust for populist Arab politics and the need for Israeli caution. It's a message he has used to temper Western calls for Palestinian independence. The troubles for the peace process are compounded by what Palestinians and Israelis both say were missteps by Obama. Obama took office promising a new American approach in the Middle East, delivering a landmark speech on U.S. relations with the Islamic world in Cairo shortly after taking office. He took special aim at Israeli settlements, saying that all construction on occupied territories must stop. This bold position managed to alienate both Israel, which felt it was being unfairly criticized, and the Palestinians, whose expectations were raised too high. The Palestinians, emboldened by Obama's stance, refused to negotiate with Netanyahu unless he halted settlement construction. A partial freeze on construction two years ago helped bring about a brief dialogue, but Netanyahu rebuffed Obama's calls to extend the freeze, and peace talks have been almost nonexistent. Obama has since abandoned his calls for a settlement freeze. The Palestinians were further disillusioned by U.S. opposition to their attempts to win recognition at the United Nations last year. Peace efforts were also hindered by poor chemistry between Obama and the politically conservative Netanyahu. In one famous incident, an angry Obama walked out on Netanyahu during a White House meeting and went to eat dinner with his family. A high-profile speech to Congress by Netanyahu was widely seen as a message to the White House that Israel has other powerful allies in Washington. Asked if the Obama administration might have done anything differently, Clinton refused to dwell on the past. "We remain focused on the resumption of direct negotiations because we believe that is the only route to a lasting peace," she told reporters. Peace is ultimately up to Israel and the Palestinians, she said. "To those who say the timing isn't right, the other side must move first, or the trust just isn't there, I say peace won't wait. And the responsibility falls on all of us to keep moving forward." Clinton said the U.S. would "keep showing up" in the hopes of advancing peace. Arab-Israeli peace efforts have often been a legacy issue for presidents in their second terms. Bill Clinton tried and failed with Ehud Barak and Yasser Arafat, and George W. Bush had a go with Ehud Olmert and Mahmoud Abbas. If re-elected, Obama may get his chance. With Netanyahu firmly in control of a supermajority in parliament and riding high in opinion polls, the two men could well be struck with each other for four more years. As for Clinton, she returns to Washington early Tuesday, ending a 12-day, nine-country trip that included stops in Europe and Asia. She has said she will leave her post at the end of Obama's current term in January. Associated Press writer Karin Laub contributed to this report from Ramallah, West Bank.